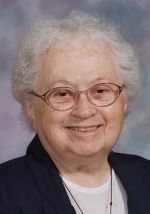 Sister Regina Mary Leonard, O.S.F. Sister Regina Mary Leonard, O.S.F., 87, died Sept. 27 in Assisi House, Aston. She had been a professed member of the Sisters of St. Francis of Philadelphia for 63 years. Born Anna Margaret Leonard in Baltimore, she entered the congregation in 1948 and professed her first vows in 1951. She earned a B.S. in education from Mount St. Mary University and an M.A. in religious studies from La Salle University. She ministered primarily in education, parish ministry and in pastoral care to the sick. Sister Regina Mary’s early years in ministry were spent in the Archdiocese of Washington, 1953-1960, followed by 19 years in the Archdiocese of Baltimore, 21 years in the Diocese of Wilmington and additional teaching experience at St. Leo the Great School in Lincroft, N.J. Sister Regina Mary moved to Assisi House in Aston in 2009 where she served in prayer ministry until her death. Her funeral Mass was Oct. 6 and burial followed in Our Lady of Angels Cemetery in Aston. Sister Regina Mary is survived by her brother, George Leonard, by her nieces and nephews, and by her Franciscan family.